I love making pesto for the week. It doesn’t have to only serve as a pasta sauce. I like it on top of fish and even as a spread on my sandwiches. This idea is perfect for a lunch party/picnic with friends on a budget. Buy a whole wheat baguette, spread with pesto and fill with whatever veggies your heart desires. Bread is a phenomenal little vehicle for whatever you would like to top it with. The pesto is a perfect toppings like tomatoes, avocado, eggs, you name it. 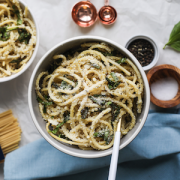 Pesto is great because the basil and almonds offer a highly nutritious topping without unnecessary fat or sugars like many other sauces or dressings do. Herbs, like basil, are often known for adding a huge kick of flavor and also having some medicinal properties. They are also known for their antioxidant properties, which can help fight off chronic diseases by fighting free radicals. Free radical damage has been linked to various cancers, aging, and a variety of diseases. Almonds put a nice spin on this pesto that is different from the standard pine nuts that most pesto recipes call for. Almonds offer a great dose of healthy fats that our bodies need for many functions such as absorbing fat soluble vitamins like vitamins A, D, E, and K. They also contain fiber, protein, and magnesium. Whipping up this pesto is super simple. All you need to do is prep all of the ingredients and combine them all into a food processor or blender. If things are not blending smoothly enough, feel free to stir it up with a spoon. Continue blending until you have reached a nice smooth consistency. If you want your pesto thinner, add more water or if you want a thicker pesto, do not add as much water. What do you like to put your pesto on? Omelettes, toast, pasta, veggies? Let us know what you think in the comments below! If you see that things aren’t blending quite smoothly, get in there with a spoon and stir.